Elijah Wood performs his version of the Immaculate Reception. It's the highly-anticipated, hugely-budgeted, all-star, all-elves blockbuster that will help imaginations soar, and rake in the big bucks from all the fans of J.R.R. Tolkien. It's the first installment of "The Lord Of The Rings" (IMDb listing) trilogy! And even with all the special effects, all the battle scenes, all the wizards and warriors...I think someone forgot to turn the "fun" switch on before they began principal photography on this enormous film. Deep in the heart of Middle Earth, golden rings were forged to balance power throughout the land. Yet one ring harvested the power of evil, and in the hands of the dark lord Sauron, enabled him to rule Middle Earth with God-like power. 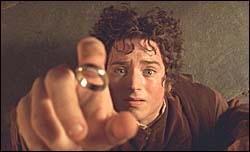 During battle, Sauron's ring is cut off and years later finds its way into the hands of hobbit Bilbo Baggins (Ian Holm). It is during a visit to the Hobbit land that the friendly old wizard Gandalf (Ian McKellen) learns of the ring's true powers, and enlists Bilbo's heir Frodo (Elijah Wood) to lead a band of Elves (Orlando Bloom, Liv Tyler), Dwarfs (John Rhys-Davies), Humans (Sean Bean, Viggo Mortensen) and Hobbits (Sean Astin, Billy Boyd, Dominic Monaghan) to the dangerous realm of Sauron's home at Mount Doom to dispense of the destructive ring once and for all. "Fellowship Of The Ring" details the commencement of this perilous journey, continuing with "The Two Towers," arriving next Christmas, and "The Return Of The King," due out December 2003. Clearly, "Fellowship" is distancing material. As a fan of the books, you are seeing the first live-action visualization of the Tolkien realm (previously rendered in the confused Ralph Bakshi animated version from 1978). All the sights, sounds and smells that were in your brain this whole time are now being challenged by director Peter Jackson's own vision for the trilogy. As a newbie to the material (as I am), this is a labyrinthine story, teeming with characters, lands and motivations that would take a 100-hour film to successfully convey thoroughly. However, Jackson is working with just 165 minutes, and though that's plenty to get across the story and characters, it just isn't enough to envelop you in the Tolkien world. Even with the accomplished production design work by Grant Major and the exhaustive special effects, only about half the film is comfortable setup and storytelling, and the other half feels like a trailer for a longer "Fellowship" that will never be. "Fellowship Of The Ring" is a beautifully captured, large-scale fantasy film unlike any other. And under Peter Jackson's watchful eye, the novel is translated with the utmost respect and dignity. I find it hard to fully criticize the film when it's really just the first section of an already-filmed trilogy. There is a lot more narrative to be travailed upon, and the characters are only beginning to show their depth. Yet, as an opener, I found myself feigning interest in what Jackson was doing. A superb filmmaker ("Heavenly Creatures," "The Frighteners"), Jacksonsaddled with a huge budgetunfortunately pushes the action sequences to the front of the story, leaving less room for the quieter, more tender reflective moments. I responded to the Liv Tyler-Viggo Mortensen romance more than I did the umpteenth (and quite monotonous) battles with the evil "Orcs" and other monsters of Middle Earth. Also, I was more drawn into the mystical realm of the enigmatic elf queen Galadriel (Cate Blanchett) than I was the betrayal subplot between Gandalf and the corrupt wizard Saurman (Christopher Lee). Jackson, never known for his soft side, happens to be making a better film when he stops to focus on the character's hearts and fears, not their broad-swords or magic spells. Yet the film is almost wall-to-wall action, which becomes repetitious as soon as it starts. Another problem I have with "Fellowship" is that Jackson never allows the film to cool down properly enough so we can finally see where the characters stand. This happens far too much in literary adaptations, and "Fellowship" is no exception. It moves at a brisk pace, leaving ample time for battles and manly grunting, but precious little time for breathing room or even figuring out just where we are in Middle Earth. While Jackson provides some closeups of maps in the outset of the picture, it is almost impossible to figure out the distances between cities and areas. I wasn't looking for a dumbing-down of the material, but a nice break here and there to make clear just what is going on, and what is at stake would've gone a long way to inviting the audience into the yarn. The casting for "Fellowship" is very commendable. Ian McKellen is solid as the wise and weary Gandalf, Ian Holm is unusually sinister as the troubled Bilbo Baggins, Viggo Mortensen shows more colors in this film than in his entire career as the brave but broken Aragorn, Cate Blanchett works wonders with her small role as the luminescent Galadriel and Sean Astin and Elijah Wood are standouts as Sam and Frodo, the two Hobbits caught in the middle of the adventure. It's Liv Tyler that appears to me as the standout performance of the film. As the tough, yet deeply-in-love elf Arwen Undomiel, Tyler is one of the few actors in the film allowed to show more emotions than simply fear and regret. The effect is euphoric. Though she's only in the film for 10 minutes, just the promise that we will see more of Arwen is enough to get excited for the remaining two installments of "The Lord Of The Rings" trilogy. But what to make of the special effects? Sure to be much debated, the computer environments in "Fellowship" range from interesting to downright awful. A film of this scope is expected to have some holes in the special effects, but some of these computer-rendered images look like CD-ROM video game leftovers. Just mounds of blue-screen and CG work that is unrestrained and exhausting to the eye. I'll give credit to Jackson and his WETA effects house for taking on such a Herculean production, as their work in the insanely picturesque New Zealand countryside is outstanding. But yikes, when the effects take a downturn in "Fellowship," (with most of them eerily reminiscent of the Marine recruiting commercials that run before the movies) they really hit rock bottom. Respect is all I can come up with when addressing "Fellowship Of The Ring." I have heaps of respect for this motion picture. It's a huge undertaking, and aspires to be something more enviable than its Hollywood counterparts. However, "Fellowship" has huge holes in its armor that cannot be overlooked, even when you take into account Jackson's passion for the material. Maybe it's too early to criticize the trilogy when we're just getting started. However, if this signals the direction the series is going to go, I'm not sure if I care to find out what happens to Frodo, Sauron and those pesky golden rings.